Here, the body and the neck are sewn, matched, and the body is covered with the jersey cloth. The body cover is one of the features of a Absolute Sweet Cindy. The surface of the body smoothes by the body cover, and externals are improved greatly. However, work to obtain the body cover comes not to bend easily somewhat troublesomely in the joint. It is possible to make, and decide a Absolute Sweet Cindy whether to obtain the body cover yet by thinking about the usage of the doll, please in there are no body covers. 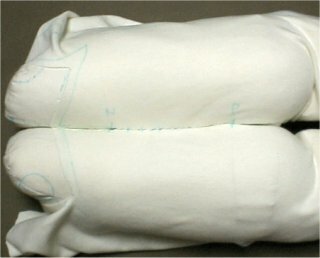 The body cover is the largest peace in the Cindi doll, and shape like a long and slender bag is had and the foot is covered with the lower half. The body is covered with the upper half. 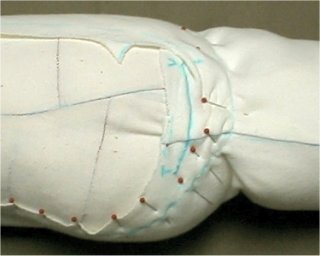 The body cover can be done by two peace for the right and for the left, and it makes it by using the pattern for turning inside out by using the pattern as it is for the left for the right. The pattern is punctured. 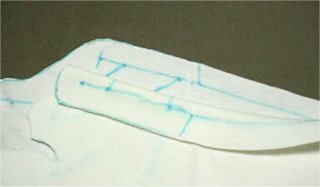 Four towels are piled up, the pattern of the body cover is put, and the center of all round signs printed on the pattern is punctured with the awl. Surroundings are traced. 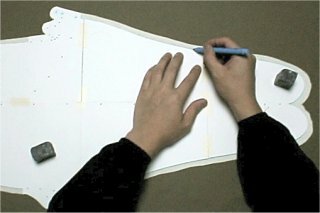 The direction where the cotton jersey cloth expands and contracts is set to, and the pattern of the body cover is put, and surroundings are traced as shown in figure. Respect marked now becomes a table. In the edge of the pattern, the majority is a needlework line. 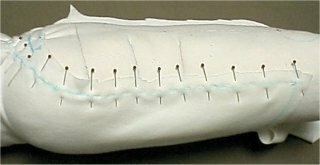 However, only the top and bottom of the pattern part (If the shape of the pattern is compared to the fish, it is partial that corresponds to back Bire and chest Bire) gone out is not a needlework line but also a cutting line. The sign is done to the hole. 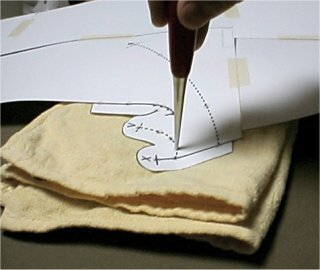 The point of the marker is inserted in the hole made with the awl, and the point is put on the cloth. The sign ties. It ties as the pattern is removed, and the point marked on the cloth is being written in the pattern in the line. Mark in popular respectThe cloth is marked by the work to here as shown in figure. A gray part shows the shape of peace. Cutting Body cover cut outThe needlework fee of one centimeter is left, and the cloth is cut. 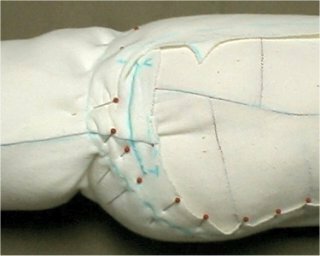 However, because the marked line is a cutting line, a part of back Bire and the chest fillet alone need not leave the margine to seam. X, b, point of a, and mark to the back The sign is put on the back. The cloth is turned over, the edge of the cloth is put, and the pattern turned inside out is put on the standard. 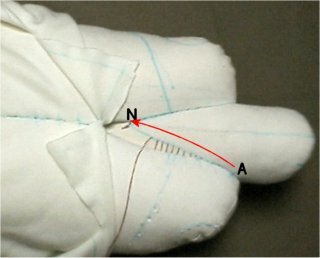 The part (X, b, and a the vicinity) from which went out by the top and bottom two places is traced and it is traced to edge about the cloth and to match fit, and to edge between X-Y. The sign is done to the hole. The point of the marker is inserted in the hole of a certain X, b, and a and 14 holes on bend line (Folding line) in top and bottom of the pattern and the sign is put. 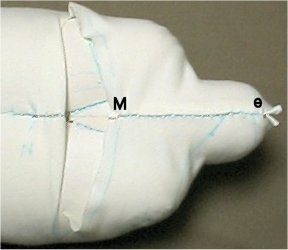 It ties as the pattern is removed, and point (X-b-a) marked on the cloth is being written in the pattern in the line when the sign is applied. 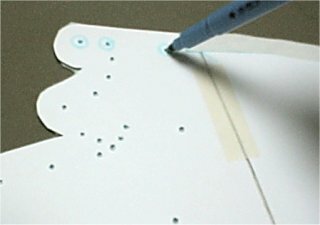 The body cover of the left side was able to be cut out by this. Mark to body cover of the right side(Have it. ) Mark to body cover of the right side(back) Right Bodecabarpes cut outThe body cover of the right side is cut out repeating the same work as the left side by using the pattern for turning inside out. Both sides reverse to the right and left body cover as projected onto the mirror though shape is the same. 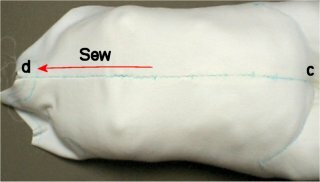 The part where the foot is covered is sewn like a long and slender bag. Position of X, b, and a X, a, and b are matched. Place in which it matches and it shutIt breaks off the cloth, and X is matched in an inside table in bend line (Folding line) at the center of the body cover cut out, and fitting X is matched and a and a are matched to b and b's. The part of the foot is sewn. 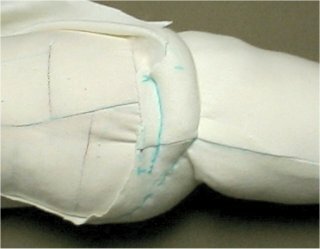 It pins between X-Y of the bent body cover (inside part of the foot) and it sews. The needlework fee the foot ahead is cut short. The needlework fee in the part (vicinity of Y) the foot ahead ..about 3milli.. is cut short. It returns it to the table. It returns it to the outside table. 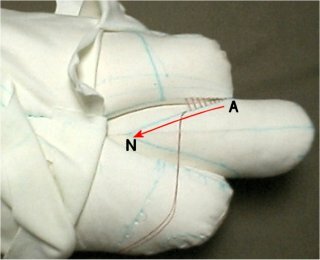 The foot of the other body cover was able to be sewn by this. The body cover of the other is similarly sewn. It covers to the leg. 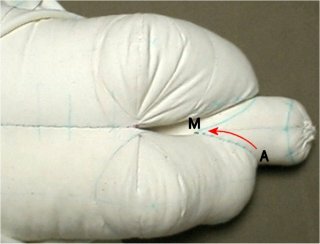 It covers a left leg with the part of the foot of the left body cover (The pattern is covered to the table the body in the place where it uses and the right side of a piece of cloth is marked) like making it put on one's socks. The space is prevented being able to be done the foot ahead. 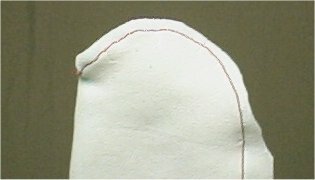 The seam of the body cover is matched to the centerline on an inside side of the foot. 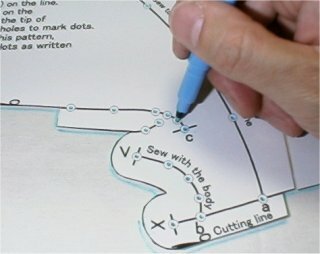 It is easy to work when the line is drawn at an inside centerline of the foot with the marker. 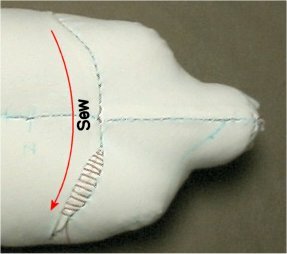 Thus, the body cover seam comes in succession on sewing point B of the knee joint. 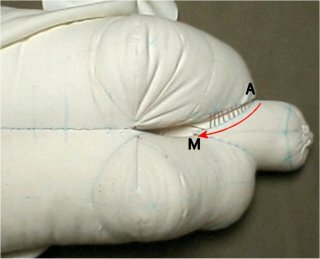 The margine to seam is knocked down in the direction of the body in the back. It stuffs with cotton the knee. 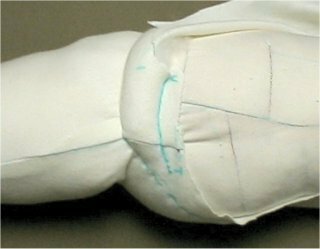 When it covers the vicinity of the knee with the cover, round cotton of about four centimeters in the diameter is prepared, it puts in the part in front of the knee, and it covers on that with the body cover. It stuffs with cotton articulatio coxae. 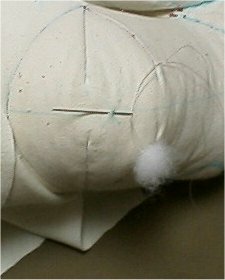 When it covers the top of Ftomomo with the cover, round cotton of about six centimeters in the diameter is prepared, it puts in the part in front of articulatio coxae, and it covers on that with the body cover. 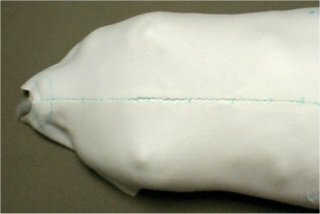 In addition, the body is covered with a remaining body cover. However, the part in the body comes because the part of the body has not become yet like the bag to remaining the opening it. 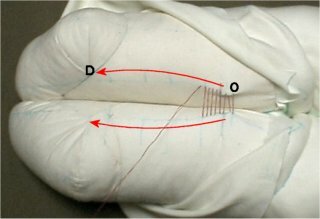 First of all, the line of V-b-T in the body cover is set to the line of V-U-T of the body, it pins, and it sews. b point need not be matched to U point. 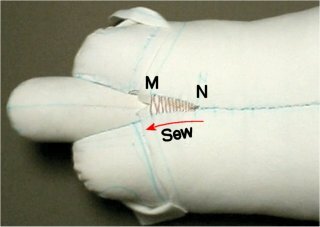 When the body cover is sewn to the body, the Sheting cloth that doesn't sew the jersey cloth alone with which it covers up but must be below is sewn by scooping it. T-V is sewn, and R-a-N-M is pinned. Slack is made in T-V and R-a-M. 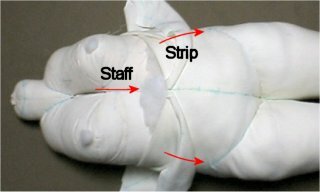 The line of R-a-M in the body cover is continuously set to the line of R-Q-P-N-M of the body, and it pins it. 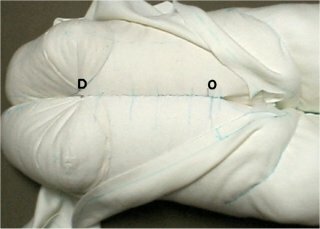 At this time, the position before and after the body cover is adjusted so that the cloth between line V-b-T and line R-a-N should not have a cramp. Moreover, extent where the marker easily enters the cloth between vicinity of a and line V-b-T in line R-a-N-M is made to be able to slacken. It sews between R-a. 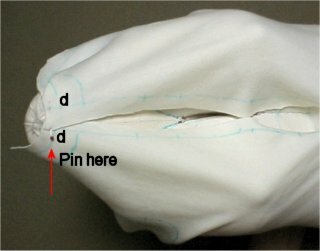 It begins to sew the pinned part from R. Because the part of R-a in front of the body is exposed after it completes, it stitches aesthetically by the backstitching. 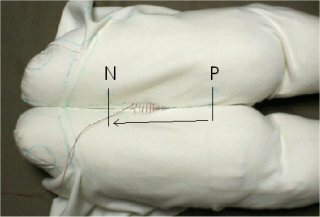 It sews between a-N. A-N in the back of the body is sewn. It leaves it without sewing between N-M. Back a-N of the body is not cared about by the Gshi needlework because it hides oneself after it completes. Cotton is packed. (See from side. ) Cotton is packed. (See ahead. 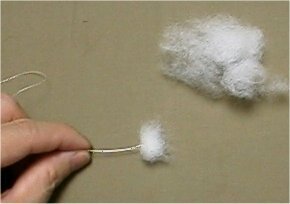 )Cotton is softly packed forward between line V-b-T and line R-a-N. It stuffs uniformly from the interior sequentially with a stick of the marker etc. 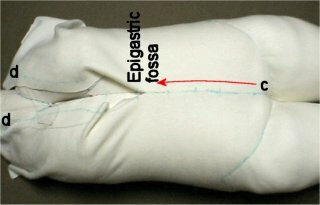 Right Bodecabar (body cover where the right side of a piece of cloth is marked by using the pattern for the back) is covered, and sewn to a right leg and a right body repeating the same work. It sews between T-V. It sews between R-a. It sews between a-N. Cotton is packed. It sews between P-N. It sews and the back of the matched body. 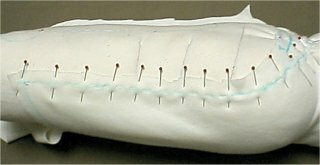 A right and left body is sewn by the ladder stitch along line P-N of the back and it matches it. It sews between O-D. 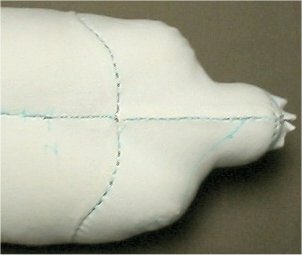 Right and left body that was sewn and matchedA right and left body is sewn by the ladder stitch along line O-D of the abdomen and it matches it. 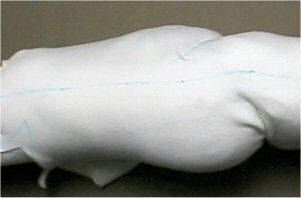 The neck is set from the upper part of the body and A point of the difference all-in and neck is set to the seam in the upper part of the body. 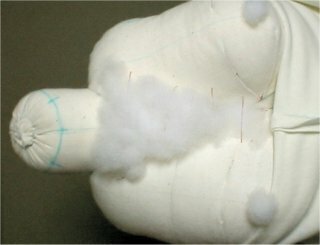 A left body and the neck are sewn by the ladder stitch along line A-N of the back and it matches it. 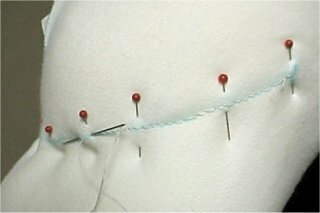 A right body and the neck are sewn by the ladder stitch along line A-N of the back and it matches it. A left body and the neck are sewn by the ladder stitch along line A-M of the chest and it matches it. A right body and the neck are sewn by the ladder stitch along line A-M of the chest and it matches it. This work is not indispensable though it is the one to show more natural the line of the chest. Please fly when it is unnecessary. 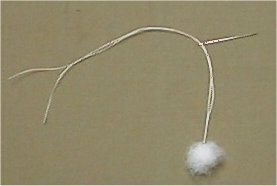 The circle at the choke end is made from the needlework string. 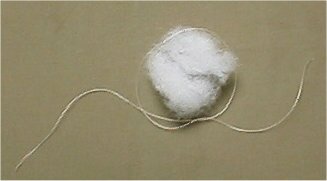 The gem of the cotton of about two centimeters in the diameter is put in the circle. 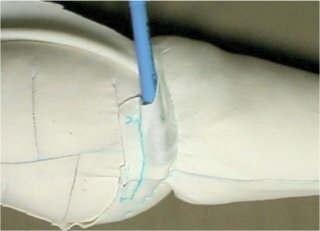 The choke end is tightened, it connects twice in addition, and it fixes. 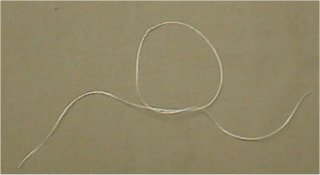 Two strings that have gone out are passed from cotton through the needlework needle. The gem is stopped to �~ sign that exists in the chest through the needle after it sews twice small and it fixes. The same work are done to both chests. 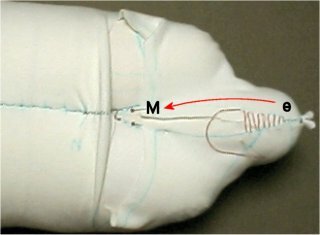 It begins to sew from c toward d. Place where even pit of the stomach was sewnIt sews to the part and Next to Mizooti in line c-d of the stomach of the right and left body cover by the ladder stitch. Because this seam is exposed after it completes, it sews in detail and uniformly. It doesn't sew to the body, and please sew and match only the cover and the cover. Even d is sewn and Next. In addition, it sews from the pit of the stomach and even the last respect d is sewn. 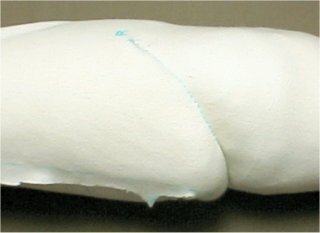 Cotton is packed into the stomach. The body cover is taken off to the part of the pit of the stomach, and cotton is packed from the abdomen to the stomach, and it seems to be a stomach and it swells it. Cotton is put on the sternum. 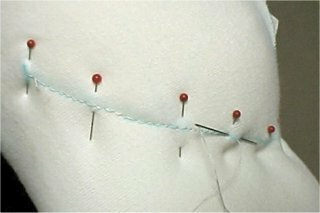 Cotton is put on the sternum a little, and so as not to shift, numerical needle is sewn and stopped in a relaxed manner. 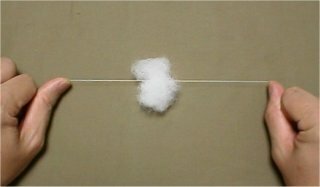 When cotton is sewn and stopped, the string is not sewn on cotton but the needle is passed through cotton. The chest is covered. It covers the neck with the body cover again. The back is sewn. The body is turned inside out, line N-M of the back is sewn by the ladder stitch, and it shuts. E-M is sewn. 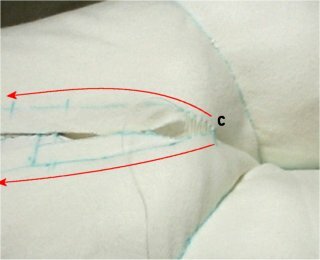 Place in which it finished sewingThe line of e-M in the back of the body is sewn by the ladder stitch and it shuts. It doesn't sew to the body, and ..body.. cover is sewn and matched. The back is sewn. 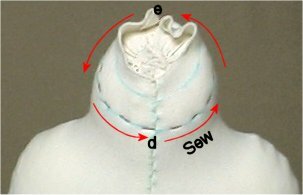 The line of W-M-W in the back of the body is fixed to the body with the pin while pulling the surrounding of M part connected with the neck of the body cover to do the wrinkle and slack in surroundings of the neck in the direction of the waist, it sews, and it stops it. The back is sewn and it shuts. Place in which it sews and it shutDarts W-M-W back is sewn by the ladder stitch and it shuts. Covered body(front side) Covered body(back)The body was able to be covered. Links of these pages are free. The banner below is also good and use it, please. "DOKU" doesn't mean the doctor. 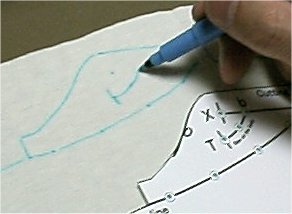 "DOKU" originates in Japanese word "DOKUTOKU". Moreover, it means unique and the original.